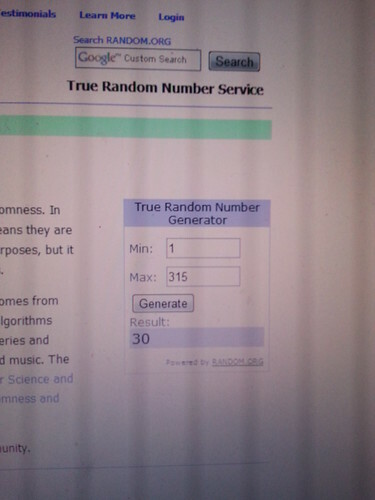 Congrats to Kathy, from Aspiring Amerliorant, for being winner RNG #30! She's got some little boys of her own, and wouldn't an orange and blue quilt just be perfect for them to share! I have sent her an email, but if I do not hear back from her by Friday 12/20 then I will pick a new winner. Thank you to all who entered, I had a great time reading everyone's comments. I've participated in several of these since I've been blogging, and I thought this time around I'd do something a little different! 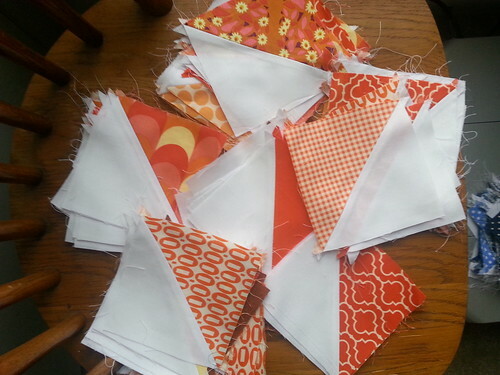 I'm giving away 150 HSTs in oranges and blues. The solid is Kona White. All the oranges and blues are designer, quilt-shop quality, with a couple Kona solids thrown in, and one Moda Crossweave. The images above are just some of the fabrics in the stack. The HSTs are 4.5" unfinished, and will require trimming. The seams are already pressed open. It's almost half and half between orange and blue, but there are maybe 10 more blue HSTs in the bunch. For those who would want to know, I piece with Gutterman polyester thread. The triangles are all left over from my X Marks the Spot quilt earlier this year, and I just don't want to make another quilt from them. They need a new home! This giveaway is open worldwide (U.S. as well as international entries welcome) and will close on December 13th at 5 p.m. PST. I will announce who the random winner is by Sunday, December 15th. **Please make sure that you have an email address attached to your comment, or I will have to pick a new winner! These colors look so great together! I'm just finishing up a HST quilt now but it's soft pinks, yellows, and grays. I'd love to make one with these bright colors! OMG this is the perfect giveaway - HST's are wonderful but Oh. So. Time Consuming to do and trim!! Fingers crossed!! 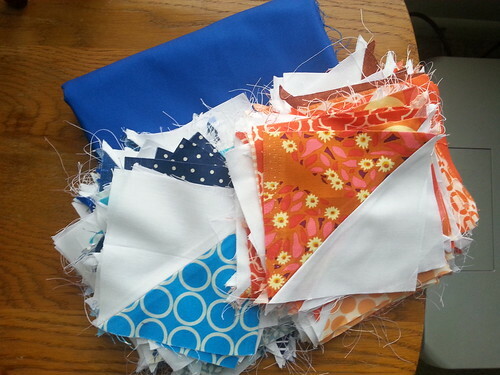 HSTs are a great giveaway idea - so many possibilities. 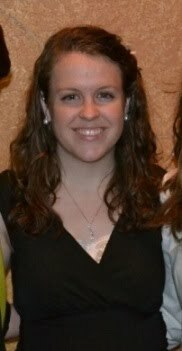 I have been following on bloglovin for over a year. I love the color combination you put together! I think that this is a great giveaway. I would love a giant stack of already sewn HST's. You know I follow, lady! Love this! You already did all the work ;) Just trimming... pshttt. Got this. Thanks for the chance! Beautiful colors and fun giveaway --- thank you! I'm a new follower through Bloglovin. Awesome giveaway! I'd give your HSTs a good home and I'm sure there are a few distant cousins of theirs here, hehe. Your quilt is beautiful and both colors work so well together. Oh, and I'm a follower on feedly! This is a great giveaway - thanks for the opportunity! I would love to play with those! Thanks for the chance. Those orange HST are great!!! Omg!! I would love to win this!!! This is a fun idea for a giveaway, there are so many great things to made with HST's! I think I would make a single huge star and call it good. I am a new follower in my wordpress reader. This would be great! Thanks for the great giveaway! Sweet! this will be like the easiest quilt ever to put together, Thanks! I just love that quilt its simple and amazing. Wow - a quilt half done! Fun! Lovely giveaway! Part of the work is already done! Thanks for the chance to win! Ooooooh! I would so love to give your HSTs a new home! Nearly all my quilts have HST in them. I like your snowflake pattern! I love the quilt you made. Looks like you did have the work for us. Would beun to play with these triangles. Send them to me, that quilt is darling and I love to trim HSTs. Thanks!!! Love that is HSTs that you are giving away! This would make such a great quilt for my friends baby boy! Awesome, great choice of colour. Thanks! Wow! What an absolutely generous giveaway! I've got a stack of HST ready to be sewn into a quilt top, so these would come handy to participate in my sewing. Thanks for the chance! This is the *coolest* giveaway prize! I love the idea of using your blocks to make something of my own - like a collaboration with a stranger! So so cool. Thanks for the chance to win - I'd love to play with these! What a fun giveaway! I can think of lots of uses for those HSTs! What a great giveaway - thanks so much for the chance!! they are gorgeous I'm sure I can find a home for them! Love!! Orange and blue is a winning combo! This is my kind of giveaway!!! !Love ready to go projects! Would love to win this the colours are amazing. How generous of you to part with all that work! Thank you! That's a really great giveaway, especially for beginner sewists like me. Thank you. Also following you via Feedly. That's a really exciting giveaway! Thanks very much for the chance, it's different! Thanks for the chance to win such fun HST! Cute, I love the quilt! I love orange and blue together! I would totally make this quilt if I won, thanks for doing most of the work! I would definitely use these for a quilt, or maybe a bunch of matching throw pillows. 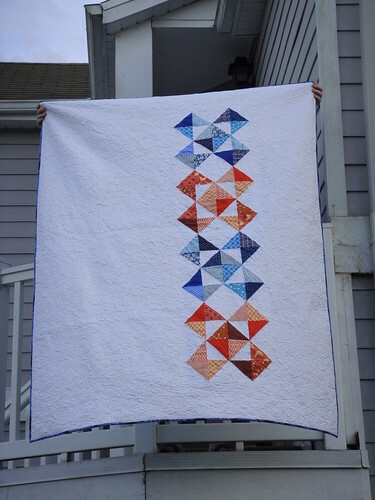 I love the combination of the orange and blue in your quilt. Thanks for the doing so much of the work and the chance to win. I think this is my very favorite giveaway! I love the colors and your quilt is gorgeous! Thanks for the chance. all the hard work done?! awesome! :) thanks for the chance! This is sooo fabulous! I have some HST's peiced to go into a quilt, but not enough to complete it. I love these colors so thank you so much for the giveaway and the chance to win. Fantastic fabrics. Thanks for the giveaway. Merry Christmas! I'd love these HSTs. You've done the hard part! What a great giveaway :) There's so many things I could make from these! Love your fabric combo.Thanks for the chance! Wow how wonderful of you to give away all that work! Thanks for a chance to win! You did all the work. I would love to make a quilt with those blocks. 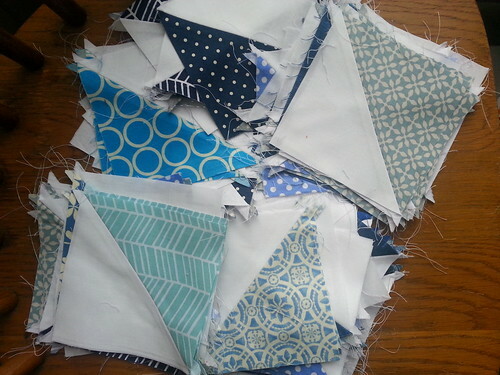 It would be so fun to design a quilt with these--half the work is done! I am just about to start my HST quilt very soon! That is a great idea! Would love to win! What a wonderful giveaway! HSTs already made! What a great idea! I would love a chance to win! Wow! That is so much work to give away. Thank you for the awesome giveaway. I haven't worked much with HST yet. Oh my gosh all that work! Yes please, I will finish them off into the loveliest quilt. Great idea! love those HST! yum! I'm a new follower, via Bloglovin, thanks! What a great color combo! I collect HSTs (yes, I'm weird) and use them in every quilt project I have, no matter what. Sometimes they're all in a row, sometimes they become pinwheels, and sometimes they make arrows. I love that you are sharing HSTs! A great giveaway. I've ideas already should they come to live with me! I am a follower, it was google, now feedly? Ohh, fun! I love lue and orange together! Thank you for the great giveaway! Oh what a fantastic giveaway! Thanks for the chance to win!! Thank you for this very generous giveaway! Please count me in, thanks! love that quilt. thanks for the awesome giveaway. I would love to make that quilt. Merry Christmas! What a great giveaway! Thank You for the opportunity to win. Wow I'm new to quilting and this would be really great for a table runner I want to make :) thanks for the chance to win! I love orange but I don't have much in my stash! Oh, pretty! Love HST. They are so versatile. How great is that - the work is done already! Thanks! Beautiful quilt! love the blue and orange. Thanks for the giveaway, I would love to make the quilt! Your X Marks the Spot is great! Would love the chance to play with these squares! I love it! Those oranges are beautiful! I would love to have a chance to work with the squares! oooohhhh I love it!! thanks for the chance! I love orange and blue! Even if they are UVA colors. What a beautiful quilt! I would love your HSTs - thanks for the chance. Orange and blue are my favorite colors!! Thank you for this giveaway! What a fantastic give away!!! I really love your quilt. Thanks so much for the opportunity. I am following you via google plus. I love the colors you used! I am pretty new to quilting (working on my 6th and 7th quilts right now) and have been meaning to try an HST quilt, this would certainly give me a huge head start! Thanks. Very lovely quilt. Would love to have some HST's. thanks for going most of the work! i'm a follower via google too!